Brass: Lancashire is the latest version of Martin Wallace's classic game set during the industrial revolution of England. The original game was released in 2007 and owing to its popularity was reprinted in 2009 and in 2015. The 2018 Roxley edition eschews the drab-art of the original and provides gamers with the most lavishly produced game I think I have ever seen. 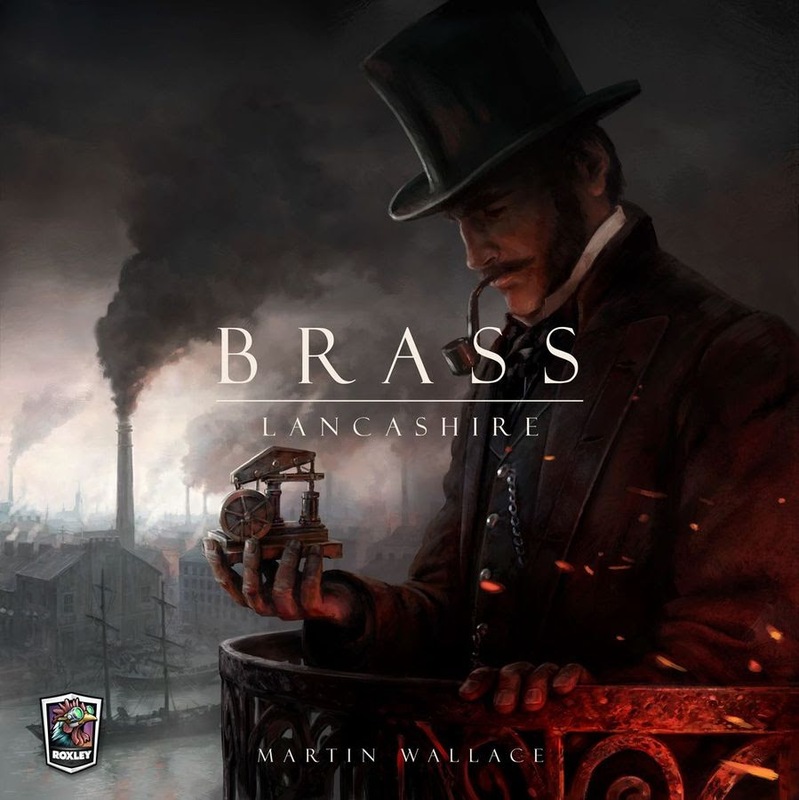 2-4 players take on the role of a Titan of Industry during the late 18th century in the industrial powerhouse of England, i.e. Lancashire. Through the game, players acquire Victory Points by building and using their industries and providing others with resources whilst expanding their own network of canals and rails. Players compete with each other to fulfil the markets' demand for coal, iron and cotton at the same time as using the same coal and iron to expand their empire. The economic mantra of 'buying low, selling high' and the euro-gamers mantra of 'do what others aren't' are pivotal for success here. This version of the game was kickstarted by Roxley Games and as a frequent consumer of Kickstarter projects, I can honestly say that this was the best campaign that I've ever had the pleasure to be part of. I think Roxley have set other publishers the gold-standard of how to do a Kickstarter and I will consider backing any future campaign they run purely on the merits of this Kickstarter. The game consists of approximately 16 rounds split over 2 eras. In each round, every player will take a turn of two actions by playing cards from their hand. Each round the player order will alter depending on how much money players spent during the previous round with the least amount going first. On their turn, players will be doing 2 of 5 possible actions; attempting to sell cotton, building industries, building connections between towns and markets, taking a loan from the bank or developing their industry to get more bonuses when it is eventually built. The industries in which players can invest and use are (left to right in the image) cotton mills, ports, shipyards, iron works and coal mines. As you would expect each of them has different yet thematic attributes which provide a benefit to the owning player and often the other players as well. Just as in the real world no industry will thrive without customers. All of these actions and industries are played through the use of a hand of cards. The cards depict either a location on the map or a specific industry type. Every action must be 'paid for' by discarding a card. The build action, however, requires the correct card to be used. For example, a player can place any industry into the specified location on the card, or the specific industry on the card into a location that is part of or adjacent to their own network. However, having the correct card to build an industry is far from the only consideration players have to think about when building. Some industries, require access to and the use of coal and/or iron in order to place them. Exhausting the resources of connected players may provide them with a larger benefit than building your own industry does to you. Your cards may lead you to focus elsewhere requiring a change of tactics. Money is also quite tight in this game and often you will not have enough money to build what you want without taking a loan first. Constraining each player to two actions per turn does lead to some agonising choices, particularly around shipyards, that have very limited possible spaces on the board and iron works, whose market cycles far quicker than coal or cotton. I nearly always wish that I could do a third action thereby, for example, preventing another player from building the iron works before I can afford it, or have access to coal in the right area and allowing me to fulfil the iron demand and 'flip' my tile. Flipping a tile is done when it's resources are depleted. When you first build an industry a certain number of coal or iron cubes are placed upon the tile to show on-map availability of those resources. As they are exhausted the industry tile is flipped which will score Victory Points for the owning player at the end of the canal and rails eras and an immediate income bonus. Each industry is quite different from in this respect; shipyards flip immediately providing large amounts of VPs and little income. Cotton and Ports have no resource placed on them and are only flipped when the sell cotton action is taken. Generally, earlier industries provide more income bonus and later ones provide more Victory Points. Striking the balance between building industries and developing them, i.e. getting access to the later industries is key. However, another important source of Victory Points, especially in the Rail Era are the connections. Each industry tile at either end of a connection will score a Victory Point per connection. So a single rail link may be worth up to 7 Victory Points to its owner; there is normally a mad rush at the beginning of the rail era to build as many links as possible, primarily for this reason amongst others. There are a plethora of difficult choices per turn for each player whereby you have to balance immediate tactical benefits with longer-term considerations, and the cards that you've got available with the actions/areas that your opponents are playing. I feel like I say this for most board games these days but truly Roxley has delivered a game with the most superb components I've ever seen. Granted the iron and coal are standard wooden blocks but this is entirely functional and does nothing to detract from the gorgeous art that permeates the rest of the game. The artwork on the board is second to none, likewise, the cards are similarly designed. I appreciated the industrial flourishes, littered throughout the game. However, the best components in this game are the Iron Clays. These are the poker chips that are provided with the Deluxe edition of the game. They feel wonderful to touch and are the most tactile poker chips I have ever used. I normally substitute cardboard or (heaven forbid) paper money with poker chips in games and my generic chips feel and look terrible compared to these. Apparently, there is a Kickstarter for Iron Clays from Roxley later this year (or early next, considering we're almost in December) that I will definitely be backing to replace all of my chips. I wouldn't recommend learning this game with 3 new players or trying to learn where all 4 of you are new, you must have an experienced player to instruct. I taught this to two of my group; they came over requesting a 'brain-burner' and this was a perfect choice. It did take the best part of 3 hours despite only reviewing the rules for about 20 minutes or so before we got into it. However this isn't really a criticism as any more-complex game will suffer from a similar learning curve. However, don't think that this is overly complex as the rules fit into just 10 pages, the duration came from every player suffering similar 'hard decisions' as mentioned above. In most of my games with the Roxley Deluxe edition, we have run out of coal cubes by just 1. Especially at the beginning of the Rail Era when lots of coal mines have just been built in preparation for the Rail Era. I have also seen bgg forums suggesting they've had games where they had run out of iron cubes, which I find hard to understand how that is possible. However, this doesn't affect game-play as you can substitute anything else for the missing cube but one or two more coal cubes (maybe iron cubes as well) would have been nice. This is a very minor nit-pick though. All elements of this game play subtly different from each other, for example, the cotton market can be exhausted, whereas coal and iron will always be available in the market. Each industry tile has different rules regarding their bonus and utilisation, canal links and rail links have different rules regarding their building and coal and iron themselves have different rules to determine players access to them. These differences are all clever design choices to more thematically represent the industrial revolution in this medium-to-heavy Euro economic game. The game is littered with hard choices and the ability to deny your opponents spaces and opportunities is rife, especially if you manage to pull off a last/first turn order combo effectively getting two turns on the bounce. You're constantly having to reevaluate your position with respect to your cards the available resources and it is certainly a brain burner that warrants its playtime and reputation in the hobby. Despite the over-the-top production, I thought the price remained reasonable and for the retail version is an absolute bargain. It's not a game for everyone though, as there are lots of subtleties to grok before you're going to be competitive and there is a significant but-easily-surmountable-with-an-experienced-player learning curve. The next time anyone requests a brain-burner, this is the game I'd recommend. I'd like to thank Roxley Games and especially Paul Saxberg for providing the review copy of this game.